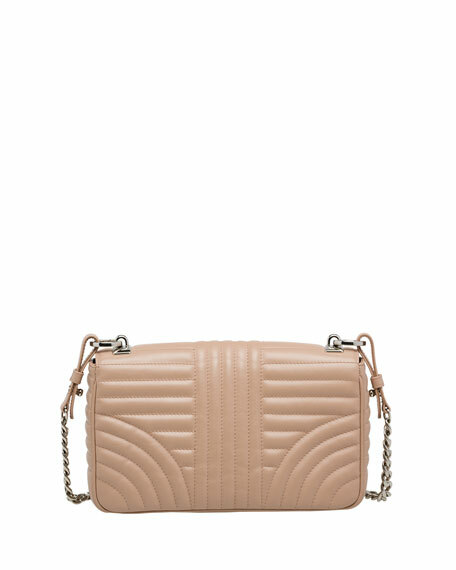 Prada quilted calf leather shoulder bag. Sliding chain and leather shoulder strap, 20.5" drop. Flap top with logo lettering; snap closure. 5.5"H x 9.4"W x 2.4"D.
EXCLUSIVELY AT NEIMAN MARCUS Prada shoulder bag in glazed calf leather with comic print and studding. Removable, adjustable shoulder strap, 10.5" drop. Flap top with buckle strap closure. Exterior, logo at center front. Hanging ID tag. 5.1"H x 8"W x 3.5"D. Made in Italy. Prada two-tone calf leather city shoulder bag. Removable rolled top handle with tassel. Removable crossbody strap, 22.6" drop. Flap top loops through metal bar front. Interior, large slip compartment. Approx. 11"W x 1.6"D x 5.5"H.